This DIY trundle bed design was made for my daughter. It is very sturdy 2×6 construction with plywood bases for the mattresses. A good DIY trundle bed needs two things. Simplicity and functionality. This day bed meets both. 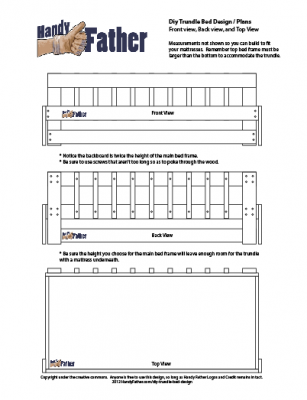 FREE DIY Trundle Bed Design Download Below!! My daughter’s trundle bed is designed for a twin sized mattress, but it could easily be redesigned for the top mattress to be a full size bed with a full size trundle. The beauty of this simple design is that it can easily be changed to meet the needs of the DIYer doing the project. The main bed is held up by four 2×6’s, the front two, to the outside edges of the mattress holding frame. The legs are on the outside as opposed to the sides to accommodate the trundle being pulled out for a sleep-over. The trundle is built 1″ smaller than the frame above, and has casters attached to the bottom so it can roll out from under the top bed easier. The back of the DIY trundle bed was made using 2×6’s, and ripping them down length-wise into thirds, making the railing. The corners were rounded off, and the railings, sanded to eliminate splinters. The bed frames are both built out of 2×6’s. The top frame is 2″ bigger than the mattress, and the bottom frame is 1″ bigger than the mattress in both directions. The frame is of simple construction, with a groove the length of each side at 1/3 the distance from the bottom of the board. Then 5/8″ plywood is inserted into the groove at 1/2″ depth all around, and the corners of the frame are then screwed together. The entire DIY trundle bed design is held together by 3″ screws. No glue is used so the bed can be disassembled if need be. This point was a life-saver when we moved, and the frames wouldn’t fit up the stairs in tact. I was able to reassemble it in our new home with relative ease. I hope you enjoy this DIY trundle bed design. I have made the plan available for download below. If you use this design, please leave me a comment below, and consider making a donation to this site so that I can continue to bring more DIY designs to light.